Hundreds of dead olive trees on the Hartebeessteich-Sud farm. 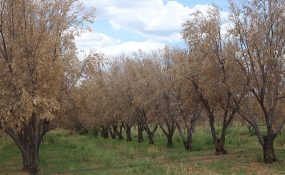 Six thousand olive trees were left to die at a 3 900-hectare farm bought by the land reform ministry in the Otjozondjupa region. The ministry bought Farm Hartebeesteich-Sud, about 7km north of Hochfeld, for N$17 million more than three years ago. Apart from producing olives, there was an upmarket lodge at the farm, which has also been abandoned. It is most likely that the farm was handed over to the Namibia Central Intelligence Services (NCIS) since it was one of those at the centre of a dispute between the agency and The Patriot newspaper in April 2018. The NCIS had to lodge urgent court action to prevent The Patriot from publishing a story on corruption around the agency's properties, of which the farm was one. The High Court dismissed the NCIS' bid to prevent the paper from publishing information about its property deals. On a visit to the farm last week, The Namibian found the trees dead, with a few cattle roaming around on the premises. There was no single human around. The Namibian later spoke to the farm manager, Sam Nepandu, over the phone, but he refused to say precisely what the government was doing with the farm. He also declined to give any contact details of someone who could shed more light on the government's plans with the farm. Instead, Nepandu insisted that there were workers on the property, but informed the newspaper's team not to speak to them as he does not like the workers talking to strangers without him being present on the farm. The previous owner of the farm, Rolf Heiser, who confirmed the transfer of ownership to the government, was not willing to answer any further questions around the transaction last week. Heiser, however, said he was dismayed about the state of the olive trees. According to some Hochfeld residents, Heiser had been growing the olive trees for about 25 years until the farm was transferred. Farmers in the area have expressed shock at the state of the farm. Some have posted images on social media, and questioned why the government bought it if the trees were left to die. One neighbouring farmer, who spoke on condition of anonymity, said the demise of the trees is a significant loss for the country. "Those olives were distributed throughout Namibia, and for the government to buy the property and let all those thousands of trees die just like that is a big tragedy for Namibia," he stressed. The Ministry of Land Reform has still not answered questions sent by The Namibian on Tuesday last week. According to a document from the Deeds Office, the farm was transferred from Heiser to the government on 16 November 2015. The document further states that land reform minister Utoni Nujoma authorised the transfer of N$17 million. The farm has also been the subject of speculation from some of the Hochfeld residents. One man told The Namibian that they don't know what was happening on the property. "We have never seen any workers on the farm ever since Heiser sold it," one resident said. "We have no idea what exactly is happening on that farm, so we think that it's a good thing that The Namibian is investigating the property," another man said.